They want more ways to save time and money. For many, Scan & Go is doing just that, and now we’re helping even more customers across the country save time with this fast, simple and easy way to check out. That’s right. 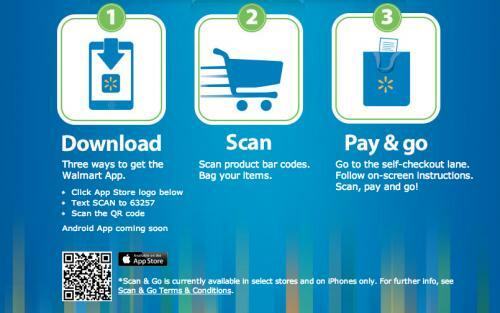 We’re expanding a test of our popular Mobile Express Scan & Go app to an additional 100 Walmart stores across the U.S. The app allows customers to scan and bag items, including produce, while they shop and pay directly with their phones. There’s no waiting in line at the register. The app is available on both Android and iOS devices and, just like shopping with Walmart Pay, it securely stores credit or debit card information for fast and easy checkout. Once customers are done shopping and have paid for their items, they simply walk through the Mobile Express lane on their way out. Not only does Scan & Go save time by letting people skip the register, it also helps make staying on budget easier. Customers see the price of individual items as they scan them along with a running total. As part of the test, some Walmart stores have been outfitted with Scan & Go kiosks where customers can pick up easy-to-use handheld devices. This allows them to try out the service before downloading it to their phones. Based on feedback from our customers and associates, we’ve made Scan & Go an even better way to shop, with many rating it their preferred way to check out in-store. Did I mention it’s also available in all of our Sam’s Club locations nationwide? Scan & Go is one of many options we’re testing to give our customers the shopping experience they are looking for. We continue to listen, test and learn – all to give our customers more options to shop how they want while also helping them save time. In conclusion:How does Walmart stay in business, while others such as MACY's are filing bankruptcy? They are listening to their customers. They watch the trends and then analyze what may be ahead. Their customers are telling them, "We want to save time and money". Walmart took a QR Code and an App and has done just that.